This isn't meant to be brand preference question, or a "what's the best" filter question, but more of a "what's this mean" question. 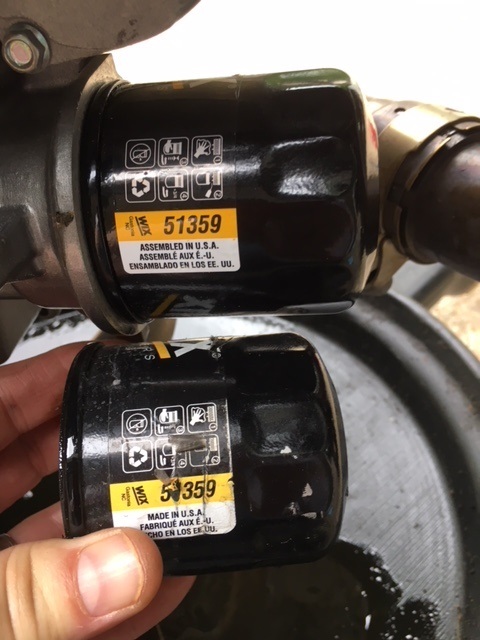 While changing the oil & filter over the weekend, I noticed the oil filter that was on the bike (from my first 600 mile oil change) said Made in USA on the label. The new filter I was installing was the same brand/same model, but it said Assembled in the USA. Are they one in the same, or is this a strategic sourcing change? Either way, USUALLY assembled in the US has much better quality checks than made overseas, so i would feel that made or assembled should produce a similar filter. Last edited by ERockJL; 04-02-2019 at 07:25 AM. Yes, assembled in USA means the parts were put together here. Most, if not all, parts are made out of country and shipped here for assembly. I assume this is done to keep quality standards higher. Made in USA should mean a certain percentage of the parts are actually made in the USA as well as assembled here. I don't know what the law says as far as percentages go. iamsmiling and Motorpsychology like this. You can label Chinese apple juice as Canadian if the bottle costs more than the contents. I remember years ago how Sears caught some flak for sending wrench blanks to Japan for rough machining, then back to the US for final machining so they could have "Craftsman-Made in USA" stamped on them. Ford took some heat by sourcing enough components outside the US in their Crown Victorias so they could be classified as imports to the tax people to lower their tax costs. Snap-on reps dont use the words "Foreign" or "Imported" to describe their tools not made in the US. Their term is "Offshore". I'm seeing more and more items being sold with the label "Assembled in the US from parts sourced globally." If its the same company i wouldn't worry about it too much. It has the advantage of being honest. Unlike other companies that rebrand stuff from china, and then claim made in america. I say this as a fan of Harley motorcycles, but I've always been impressed by the cognitive dissonance of the Bar and Shield between the image they (and their diehard fan base) deliberately tailor that they're the embodiment of all things American, and the fact that they've been sourcing parts from multiple foreign countries for years. Seeing Harley project the image of "American Built, American Pride" while deftly ignoring the fact that they're building a bike with forks and electronics made in Japan and brakes made in Italy, among other parts, is a guaranteed laugh. They're deliberately vague on just how much of the construction of their bikes is outsourced, knowing how big of a dent it puts in the "America Built" mythology. Even better is hearing one of the Faithful deride another bike as a rice burner or Jap Scrap, without a trace of awareness of the irony that the bike he's throwing a leg over has a fair amount of rice included in the sticker price. STCorndog and Coach23101 like this. Wix is literally just up the road from us.